A good night’s sleep has been shown to boost memory, enhance creativity, increase attention span, reduce stress, and ultimately improve health. If you suffer from insomnia, sleep apnea, tinnitus or you are just too stressed to sleep you may be missing out on those benefits. You don’t have to miss out any longer–white noise has been proven to help people like you fall asleep faster and stay asleep longer. Over the past decade, research has revealed the importance of sleep and the benefits of white noise. As a result, white noise products have become more popular. With so many products on the market you may struggle trying to decide which option works best for you and your lifestyle. 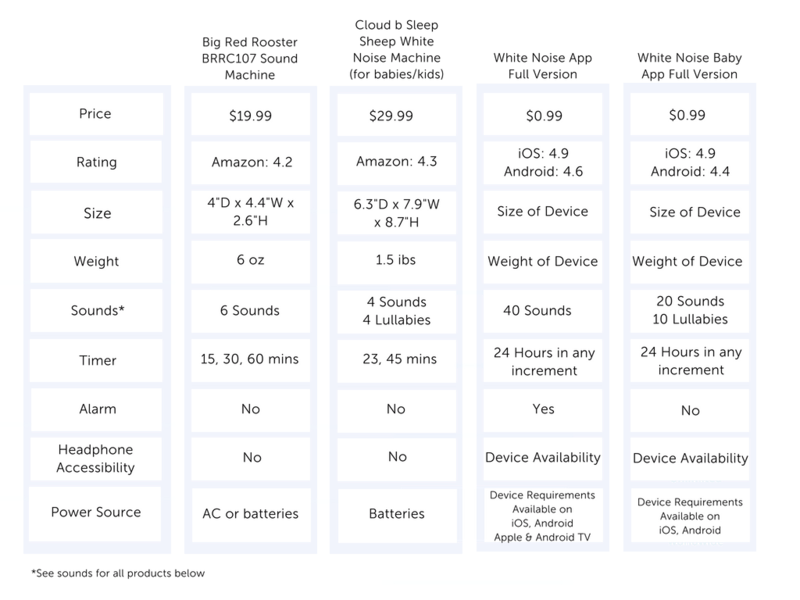 We did the research and have compared common characteristics of white noise apps and machines. We hope the analysis will help you determine the white noise option that is best for you! 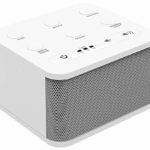 The price of the white noise machines range from $12.00 to over $200.00. This is significantly higher than the apps which generally range between free and $2.99. Both apps used in this comparison offer lite (free) versions. The products used in the comparison had ratings above 4 stars out of 5. Below is a list of detailed data on the ratings and the number of customer reviews. iOS 4.8 stars with 15,500 reviews and is a Top 20 for Health & Fitness. The size and weight of the white noise machines vary. Alternatively, an app is in the device you likely carry with you everywhere you go already! The apps are a great option for people who travel since there is no additional luggage space needed. Each app and machine are different, however apps are able to hold more sounds than the machines. Find the list of sounds for the products we analyzed below. Big Red Rooster BRRC107 Sound Machine 6 sounds: White noise, rain, brook, ocean, thunder, summer night. 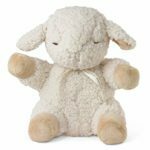 Cloud b Sleep Sheep 8 sounds and lullabies: Mother’s heartbeat, spring showers, ocean surf, whale songs, Twinkle Twinkle, Rockabye Baby, classical lullaby, tranquil melody. Additionally, the White Noise and White Noise Baby apps offer a free companion app called White Noise Market. 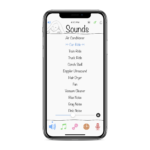 The Market offers an additional 10,000+ sounds that users can download to their White Noise Lite, Full, Pro, and Baby apps for FREE. Most white noise machines don’t have alarms, but they generally have timers in 15 or 30 minute increments up to 90 minutes. While some white noise apps have alarms, you should check the features list before you download an app. The White Noise app features an alarm that includes 20 sounds. 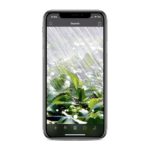 Additionally, the White Noise and White Noise Baby apps include timers that offers minute increments for up to 23 hours and 59 minutes. Some high end white noise machines (over $100) include headphone jacks for listeners. The apps will vary depending on your device. If the device to which you download your White Noise app has headphone accessibility, you will be able to listen to your white noise with headphones anytime, anywhere. Most machines use AC, batteries, or USB as a power source. The power source for the white noise app will depend on your device. We hope this comparison has helped you make a more informed purchasing decision. Still not ready to commit? Take the White Noise apps for a test drive by downloading the free versions. Click here to download White Noise Lite or download the White Noise Baby Lite app for iOS or Android. If you decide to upgrade to the full version, you can do this through the app or by visiting the app store of your choice. This entry was posted in Sounds, White Noise and tagged sleep, sleep sounds, Sound, white noise. Bookmark the permalink.